As you can see in my other posts, I like to stroll along the streets of Utrecht, Amsterdam or other cities that appeals to me. Being a kind of car nut as well, I scan the streets for cars that in some way fascinate me. I spotted this Mercedes (a W123 if you really want to know), parked across the street. I am not a Mercedes kinda guy, but the funny thing is that in my opinion these cars age very well. 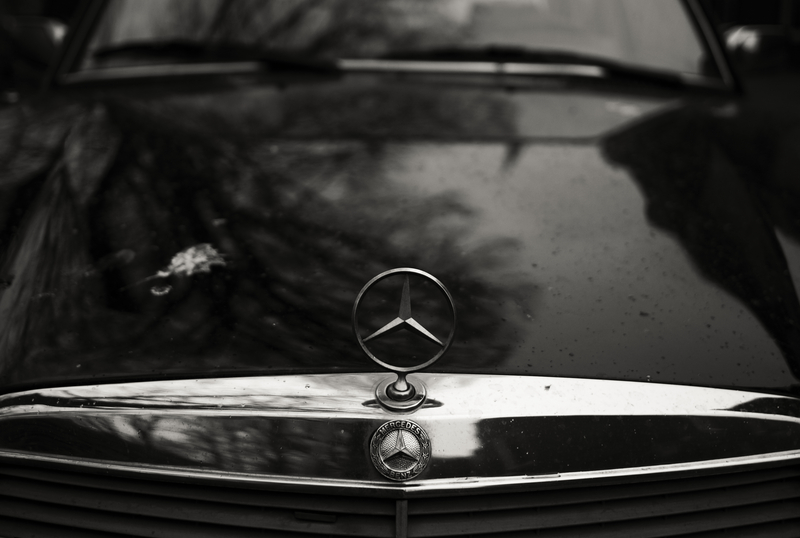 The delicate and classic profile of the car reveals a beauty which does not resonate with the brand as it is nowadays. Taste aside, this is probably a very debatable statement as back in the seventies and eighties, this brand was as posh and business men-like as it is nowadays….Makes me think whether this phenomenon of not appreciating things in the present time frame is a good thing or not. Anyways, I just like vintage stuff or engineering that just looks old and authentic. I own a Ducati motorcycle and although it’s only about 11 years old, it has that classic look. I love it to bits. Broad chrome handlebars, stainless steel fork and a big round headlamp. A muscular stance and with an engine that’s not hided by a big slap of plastic. The Leica rangefinder is a wonderful piece of engineering too, all frapped in a sober, minimalistic but beautiful design of black painted brass and steel. A Leica rangefinder ages very nicely as well because when used extensively, the paint will be come off, showing the brass that’s underneath. Once you’ve purchased a Leica lens, you can it use all your life because you can use it on old and future Leica’s as well. I think that sums my fascination for all that’s classic, vintage and authentic all up quite nicely, don’t you think?